Doc Brown Double Bell Clock Prop from "Back to the future"
Welcome to Fluxy88's listing for Doc Brown's Bulova twin bell alarm clock movie prop! We created this clock to look exactly like the same model as the one seen in the end of the first Back to the Future movie. We designed the clock and clock face to match the movie screen almost perfectly! 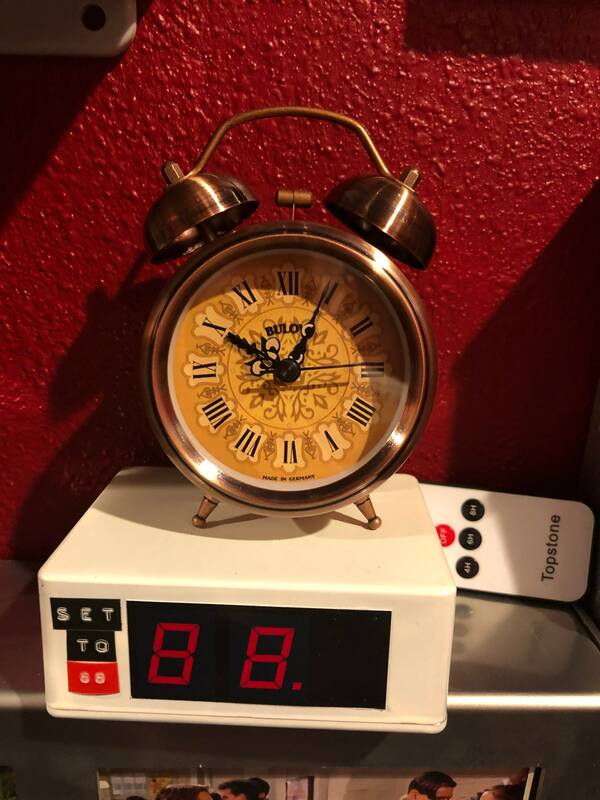 Our clock is metal(steel) colored bronze/copper, NOT plastic! In the movie, Doc Brown holds the clock in his hand and places it on the Delorean dashboard. Our clock is the same EXACT size of Doc Brown too! - Real working 2nd hand ticking! - Turning the on/off switch on the back of the clock now rings the double bell alarm. Set the hour you want and turn it on to hear the bell ring! - ONE AA battery included! The time is permanently set, ( time is non functional clock) but the second hand is real and ticking!. This prop is for display. This listing is for the clock only! Exactly as pictured! Arrived right away. Looks great printed out. Exactly what I expected and arrived quickly ! Back to the Future - 6 Driver License Props!